These Chocolate Chip Toffee Strip Cookies are a fun variation on the classic chocolate chip cookie. What are Chocolate Chip Toffee Strip Cookies? 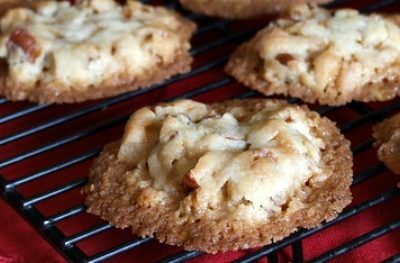 The dough is addicting on this chocolate chip cookie recipe. It’s chocolate chip and toffee all wrapped into one cookie. When you make these cookies, the dough is divided out into four sections- each rolled between waxed paper, then they’re baked as giant cookies. Just out the oven, they’re cut into cookie strips. I must say that I really love the way these cookies are created. It’s different than your typical chocolate chip cookie, and that makes it appealing. They’re a delicious chocolate chip cookie with hints of toffee here and there. 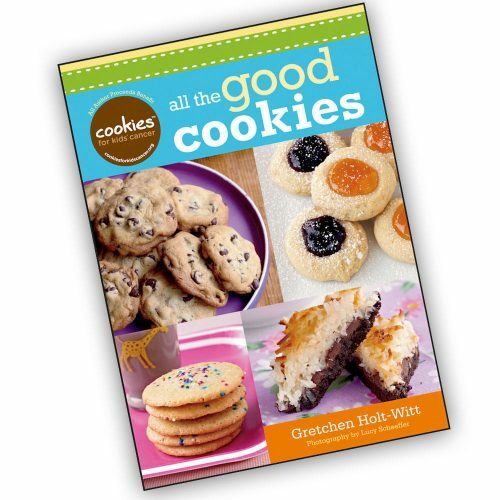 I’ve never been one to pass up a cookbook full of cookie recipes. I love cookies of every kind, and they’re definitely my favorite thing to bake. But I suppose the real reason is that I’m terrified that I’ll miss something if I don’t pick up a newly released cookie cookbook. What if they’ve done something with Snickerdoodles that I’ve never heard of before, what if they’re sharing a chocolate cookie recipe that people will oohh and ahhh over, or what if there’s a chocolate chip cookie recipe that is unique and fabulous and must be tried? I can’t stand the thought of missing out on something. Plus, I eagerly read cookie cookbooks like they’re a delicious new novel. Cookies for Kids’ Cancer was founded on the simple belief that no one can resist the allure of a cookie or the desire to help a worthy cause. 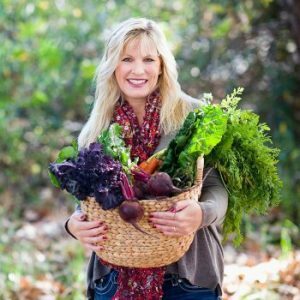 This people-powered charity has used community bake sales to raise millions of dollars to help fund new therapies for pediatric cancer. The first Cookies for Kids’ Cancer cookbook introduced the cause to tens of thousands of new supporters with a collection of delicious recipes perfect for a bake sale or anytime. Now, in All the Good Cookies, this all-new cookie compendium, you’ll find a wealth of mouthwatering recipes that will satisfy any cookie craving, from Raspberry Thumbprints to Boston Cream Whoopie Pies. And since all of the author’s royalties go to Cookies for Kids’ Cancer, every copy of All the Good Cookies you buy will help kids fighting cancer. I had a hard time deciding which recipe in the book I wanted to try. Other recipes that sound awesome to me are: Mary Hickey’s Toffee Bars (I guess I have a thing for toffee! ), Chocolate Pillows, Benne Burgers, Apricot and Raspberry Thumbprints, Emma’a S’Mores Balls, and Peanut Butter Nanaimo Bars. It’s a great book to have on your cookbook shelf, and purchasing it all goes to a good cause too. 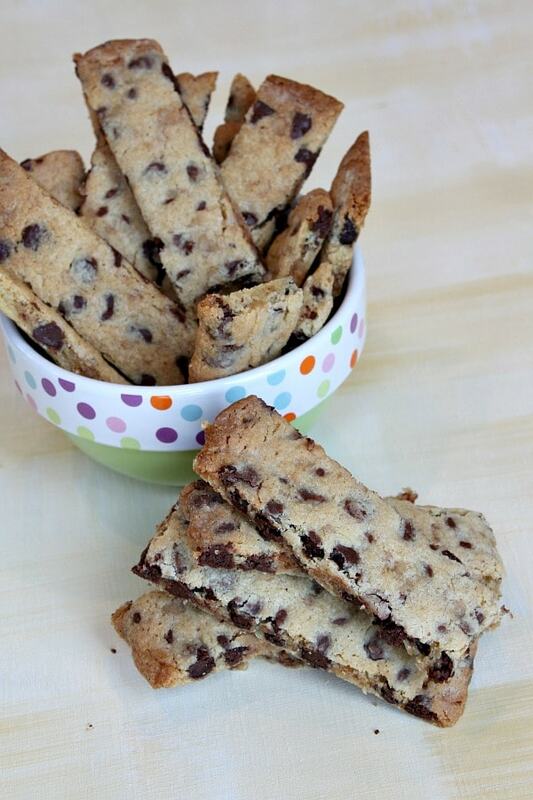 These toffee chocolate chip cookies are rolled out and cut into strips for serving! Place the butter and sugars in a large mixer bowl and beat until smooth and creamy, about 3 minutes. Add the egg, egg yolk and vanilla and beat until incorporated. Scrape down the sides of the bowl. With the mixer on low, add the flour, baking powder and salt; beat well and scrape again. Stir in the chocolate chips and the toffee. Divide the dough into quarters. Roll each quarter of the dough between two floured sheets of waxed paper into an 8-inch or so square. Transfer the cookie squares to the prepared baking sheets. Bake until lightly browned, 15 to 17 minutes. 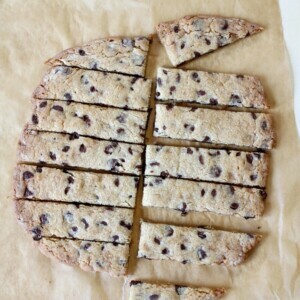 While hot, cut each cookie square in half, then cut each half into eight 1-inch slices. 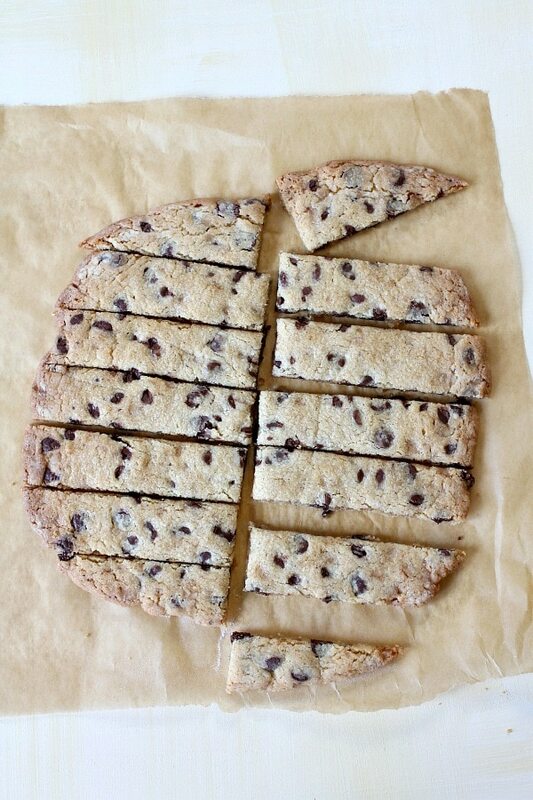 Cool the slices on the cookie sheets completely. *Store in an airtight container for up to 3 days, or freeze for up to 3 months. Disclosure: I was given a copy of All the Good Cookies for review and permission was granted to share a recipe from the book. All opinions shared are my own. There are Amazon affiliate links included within this post. 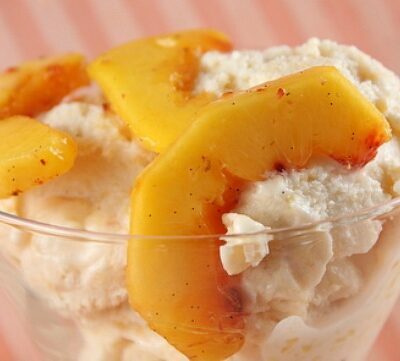 Just made these and they are delish. However rolling out did not work for me. Ended up being a huge sticky mess, so regular cookies it was instead of bars but still amazing. 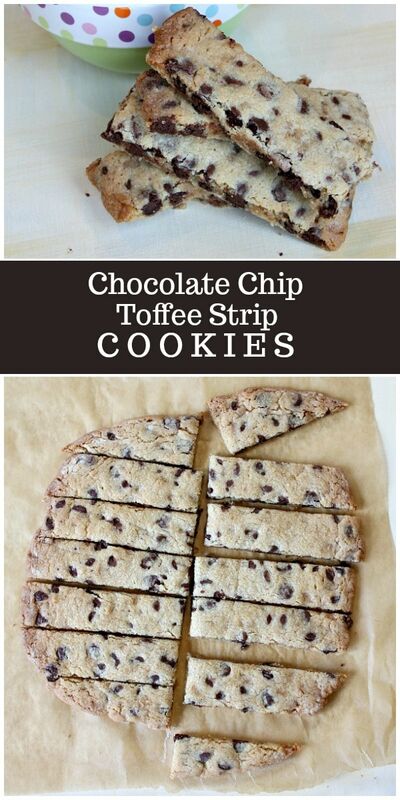 I love the idea of a rectangular cookie. These look awesome. I’m going to have to check out this book. Those looks so great, something I would enjoy with tea or just on its own. 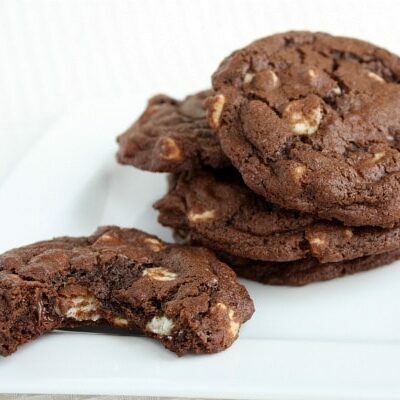 My favorite cookies are the chocolate and macadamia cookies. yum. These look delicious! I love chocolate chip cookie bars, but the addition of the toffee bits is even better! 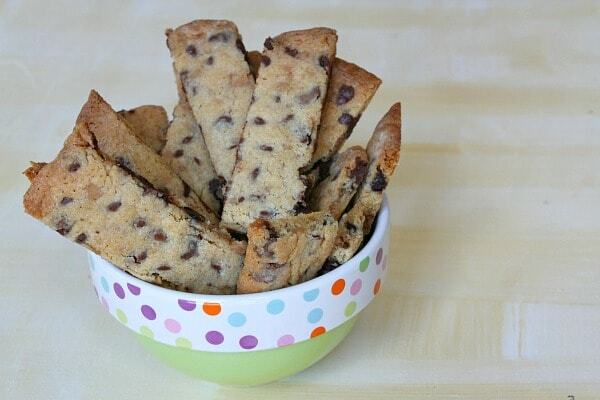 What a fun take on chocolate chip cookies! I love that these are a little different than the normal cookie bar. And that cookbook sounds fantastic! These look delicious. I can’t wait to make them. Mmmm…these look so good! Love the strips! These would be great with coffee or by themselves. Looks so yummy! These look absolutely delicious! Thanks for the giveaway. Such a yummy batch of cookies and a great giveaway, Lori! Thanks for sharing!